The 3 room apartment 60 m2 is just new renovated and part of a 5 apartment house. The flat is made to use for couples or small family with max. 2 kids. We offer one room with a queen size bed and a room divided to a wooden sliding door with a bed sofa for one adult ore two kids. The house is placed in Grindelwald on the sunny hillside and offers a perfect panorama view. Next to the Eiger North face and to the Wetterhorn. Vis-à-vis the Mänlichen and the Kleine Scheidegg. There is a bus station direct in front of the house. The construction is made in high standard and encloses massif parquet, decorative wooden and stone structural elements. There is a sleeping room with queen size bed 160cm and an additional davenport in the second room which can be separated with sliding doors. Bathroom with bath tube/shower wash. With beautiful terrace 14 m2, laundry on the ground floor and garage for one car in house. This apartment with natural materials gives a comfortable and cozy ambience and convenient for two persons. We like nice furnished and fully equiped appartments. TV, WIFI, dishwasher and a fully equiped kitchen. During your stay you can use the Swisscom WIFI named for free Internet. Balcony with wooden deck, 2 chairs and sun loungers. New renovated luxury appartment with wooden floor, stone wall and design furniture. Made fo people they enjoy nice and stylish living. Dedicated to two persons who like to enjoy tasteful living in the mountains. We are very glad you had a nice vacation in our Apartment in Grindelwald. The view is amazing and by our self we like to stay up there in the fantastic mountain world. We try to do that our best to make our guest as happy as possible. We are glad of every feedback. Thank you very much. Looking forward having you again. Loved this beautiful apartment again this year! We stayed this apartment last year and loved it, we came back this year and loved staying at this place again. The kitchen is well equipped, the bathroom has a good space and very clean. The living space is very spacious and neat. And the best part is the view! Spectacular! Sometimes we felt like we didn't need to go anywhere but stay in the apartment and enjoy the view of the Eiger, Wetterhorn and the alp. So beautiful!!! Franz and Diane ensured we had a pleasant stay in Grindelwald. Thank you. We'll come back again. Thank you very much, we are very glad that you like the apartment. Also for us it is always a great pleasure spend some time up in the mountains. We are very happy to share the alpine atmosphere and we try to do everything making our guest happy. You are anytime welcome to come again. Best Regards! the apartment is located in a beautiful district with a view of the Alps mountains, the apartment is equipped with everything you need , access to the washing machine so you can do the laundry everything is neat tidy and fragrant absolutely recommend! Great apartment with even greater views! Comfortable stay with two adults and a teenager. We made good use of the Jungfrau Travel Passes we bought. Bus stop is a few meters right, down the hill, from the apartment. We cooked our own meals in the apartment, which has a good selection of pots and frying pans, etc. Pantry was well filled with wide range of herbs, some spices and cooking oil. Very good wifi and a selection of adapters (for EU plugs into Swiss sockets). Best bit though is spending a few hours each evening on the balcony watching the landscape! Awesome. Certainly recommend the apartment for a couple or small family. Thank you for the estimation to our apartment in Grindelwald. We are glad to hear that our guests are happy and that you had a nice time in Grindelwald. We are looking forward having you again. We wish you a pleasant time. From the moment we arrived we felt instantly welcomed. The property is extremely clean, organized and very spacious due to the overall design and layout. The beds are firm but comfortable. The view was one of the best in all of Grindelwald and you are awakened each morning to the view of the Eiger directly in front of you. The apartment has all the amenities one could need including a well stocked kitchen with utensils, dishes and glassware. We shopped at the local CoOp grocery store in Grindelwald and saved a considerable amount of money by making our own meals and picnic lunches for day excursions. The wifi was very strong and we had no issues. There is laundry in the basement (no dryer) but plenty of racks and clothes lines. The laundry costs around 2 dollars U.S per load and there is a meter for the money in the wall (it takes Swiss coins). We did not plan our trips in advance since the weather can change day to day so we took it a day at a time and had no problems booking cable cars or gondola rides at the last minute. There is no shortage of activities in the area and you don't have to travel far to have a good time. We have stayed all over Europe and this was by far the best property we have ever used. We are very glad you had a nice time in our apartment in Grindelwald. We use the apartment very often by our self and we like to serve guests at the same quality as we would expect when renting a apartment in the alps. The view from our flat ist fantastic and one of the best in Grindelwald. We thank you for the feedback and looking forward having you again. 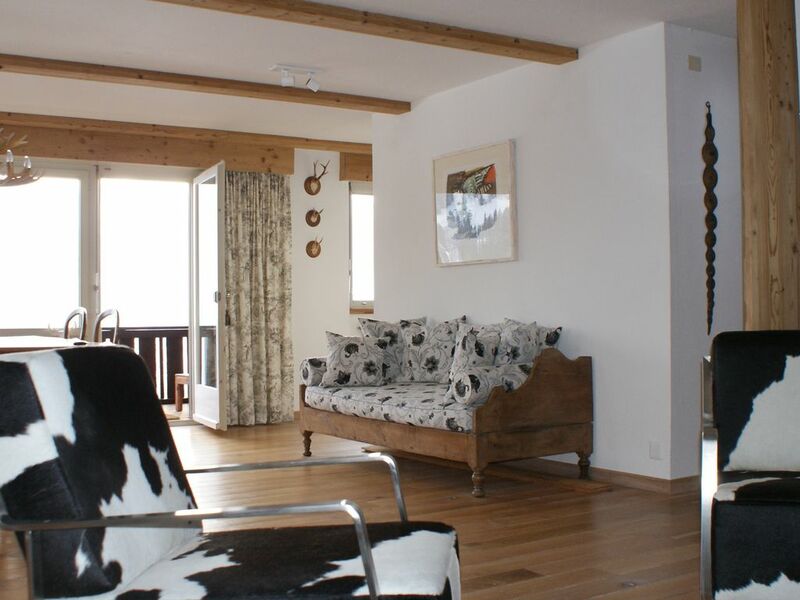 We loved this apartment it has fantastic views of the Eiger, Wetterhorn and other mountains. The apartment has everything you need and has a lovely balcony to sit on to enjoy the views. So peaceful and relaxing. It is One and a half miles from the train station uphill so a bit of a walk with suitcases. You get a free pass for the buses on arrival to use within Grindelwald but the last bus is at 18:44, you can get the 121 or the 128 to the school near the apartment. You can also use the sport centre swimming pool free with the pass. We got a taxi on arrival as we arrived late at 11pm this cost us 24 Swiss francs which is expensive for a mile and a half journey to us. I would highly recommend this apartment as it is easy to get to all the mountains on the trains And buses and has fantastic views and facilities. The only thing missing for us was a welcome pack of milk, bread and juice maybe as we arrived late and no shops open then. Lots to see and do in the Jungfrau region and so so beautiful -Thank you for a wonderful holiday.